With no travel plans this holiday week, I've been mostly doing some scopic driving on Google Maps. Yesterday, I had a look at the gamma field of the Institute of Radiation Breeding. Today, simply out of curiosity, I went to look at the former site of South Central Farm to check out what, if any, replaced the 14-acre community garden. 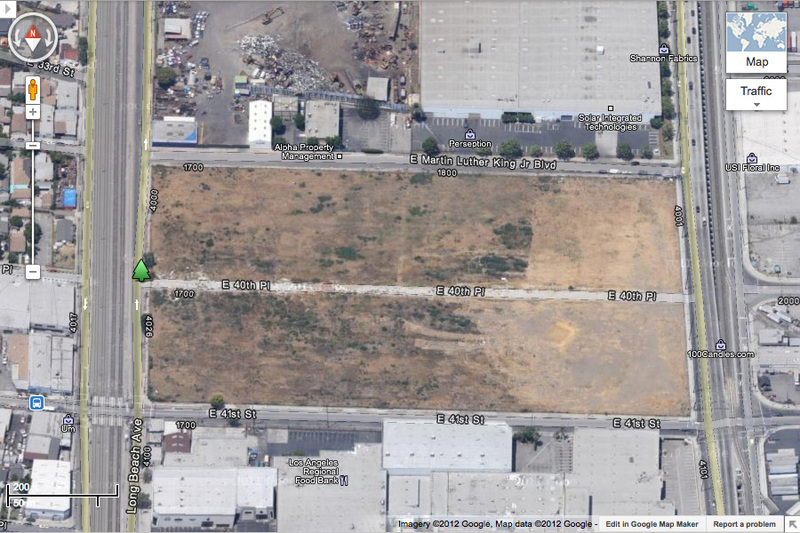 You might remember the shocking patch of greenery surrounded by industrial warehouses in South Los Angeles. Starting in the aftermath of the 1992 riots and for over a decade until they were evicted in 2006, hundreds of mostly immigrant families grew sugarcanes, corn, cactus, lettuce, winter squash, broccoli, lettuce and tomatillos; tended to their avocado, guava, banana and peach trees; planted chokecherries, herbs, chayotes, nettles and roses. Note the Los Angeles Regional Food Bank to the south of the site. It's ironic that an organization with a mission to fight hunger in the city is located next to this idling food desert, this potentially productive landscape where families of modest means indeed once grew their own food but now, perhaps for some, are receiving help from the nonprofit. A farm is coming for it. It's only a matter of time.